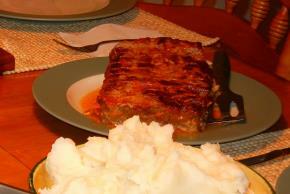 Mix all ingredients for meatloaf together in a bowl and place into a small loaf pan. Mix sauce ingredients together and pour over meatloaf. Bake at 350°F for 1-1/2 hours.